Stellenbosch is South Africa's second oldest town initially settled by the Dutch East India Company to produce fruit and vegetables for ships passing through the Cape. The town is named after Simon van der Stel, once Governor of the Cape. Set in the valley of the Simonsberg and Helderberg mountains, the "town of oaks" or Eikestad, is dotted with Cape Dutch architecture, oak lined streets, fine restaurants, antiques shops, university buildings and students. Surrounding all this are beautiful vineyards and the bustle of a vibrant provincial wine producing goliath. 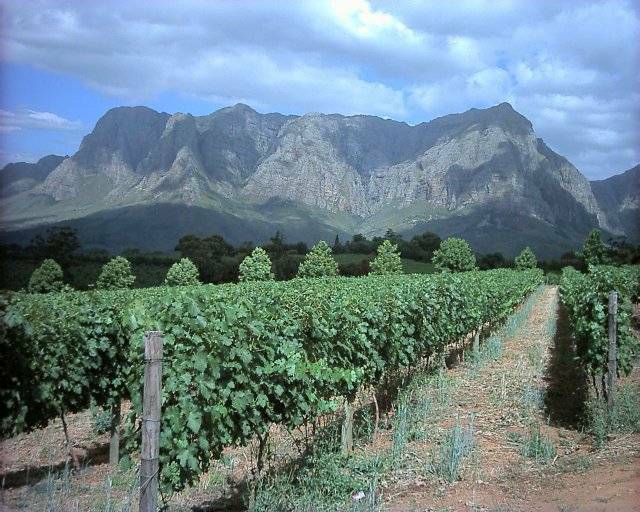 Stellenbosch is probably most famous for it's excellent wine from the surrounding estates. Lining the Simonsberg, Jonkershoek, Helderberg and Stellenboschberg Mountains, the wineries are picture perfect settings for an afternoon picnic or tasting session. There are literally hundreds of wineries to visit in Stellenbosch, each with their own character and ambiance. Most do wine tastings for a small fee and some have restaurants opened for lunch and/or dinner. Take the time to visit some of their web sites listed below in our "What to Do" section. Historic Dorp Street is an oak tree-lined street with Cape Dutch, Victorian and Georgian architecture. Visit some of the delis, restaurants, antique and souvenir shops along the street. The Dorp Museum is also referred to as the Stellenbosch Village Museum. 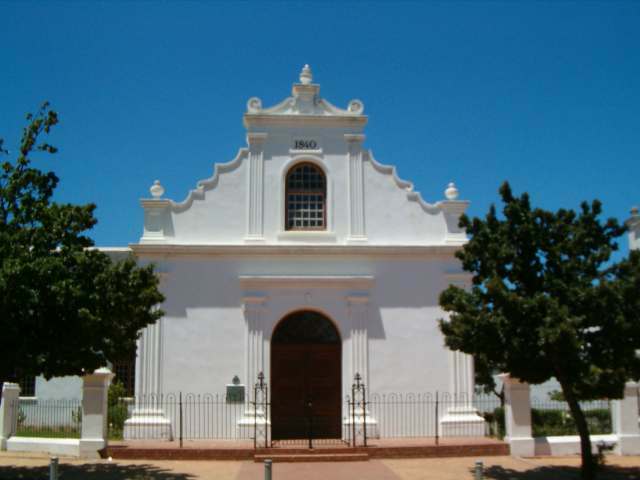 The attractions here are visits to 4 different houses of particular architecturally and historically important periods in Stellenbosch's history. The four houses are Shreudeurhuis, Buettermanhuis, Grosvenor House and Om Bergh. The dates of contruction of the houses range from the early 18th to the late 19th century. All four houses have been well restored and feature furniture and antiques amongst other items of interest. The Moederkerk or Mother Church is one of the town's most photographed buildings. It is located on Drosty Street. Oom Samie se Winkel or "Uncle Sam's Shop" on Dorp Street is a shop set in the olden days. Various interesting products are sold there including wine, tobacco and fish, it's well worth a look at this Stellenbosch institution. 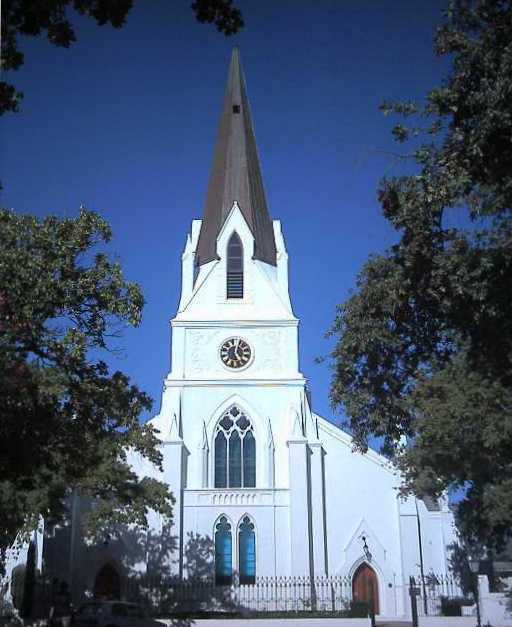 The Rhenish Church is located in the centre of Stellenbosch across from the town's open area park. The church initially served slaves and the underclass as a clubhouse until 1830 when the church joined the German Missionary society. The picture to left is of the wing added in 1840 to enlarge the church in order to accommodate a larger congregation as a result of the emancipation of slavery of 1838. The church is now a South African National Monument. Stellenbosch is home to the only Afrikaans university in the world, it was officially founded in 1918 but its history dates back to early beginnings as a Theological Seminary in 1859. The University is one of South Africa's premier educational institutes and provides the town with an influx of youthful exuberance and playfulness every new school year. Take the time to walk along Ryneveld and Victoria streets to appreciate some of the wonderful architecture used to build the beautiful university buildings. Also of interest are the University Museum, the botanical garden and the Ou Hoofgebou. Students of the university are called "Maties", the name is earned once an acorn falls on your head from the hundreds of oak tress that line the streets of the town. Much of the nightlife in Stellenbosch caters to the partying needs of the young Maties, so if you are looking to have a few drinks, there are a few places in town to quench your thirst. The botanical gardens form part of the university and contain a wide variety of indigenous and foreign plants. To experience Africa and Stellenbosch from a local point of view, you can visit our associate specialist tour guide, Cape Options, based in Cape Town for - Stellenbosch Guided Tours. Being a major wine producing region of the world, wine tasting in Stellenbosch is an excellent way of discovering the intricacies of the excellent red and white wines and brandies produced in the region. You'll find more on the areas vineyards and wineroute at www.wineroute.co.za or with the links to some of the vineyards in the Stellenbosch region listed below. Walking in the surrounding mountains of Stellenbosch is a local obsession. You can take to the 5 different trails of Jonkershoek, the 24 kilometre Vineyard Hiking trail, horse riding through vineyards, hot air ballooning, mountain biking, fishing or just enjoying a quiet picnic at an estate. The Western Cape coast is between 20kms and 50 kms from Stellenbosch. Get in the car, take an umbrella, some sun tan lotion and "catch a tan". Strand and Gordon's Bay are nearby and have nice beaches. South Africa's beer is selection includes Castle, the Namibian Windhoek and Tafel, Hansa, Black Label and a wide range of foreign imports. The Western Cape has some excellent wines to please even the pickiest of palettes. Many wine estates are open for visits and tasting. The price is good, the setting is beautiful and the wine is excellent. Franschoek, Stellenbosch, Robertson and Paarl are of particular interest. South Africa's very own bubbly. The traditional Methode Champagnoise is used to produce this excellent, dare we say it, "Champagne". When you are so close to the coast, you can feast on crayfish, lobster, muscles and prawns. Calamari is also a definite treat and why not try a salty fish called snoek - smoked, grilled or fried. Biltong is dried meat. You can get all sorts, hot or mild. In supermarkets, rest stops, fast food joints and several other places, you'll find pies. Not the healthiest of choices but affordable and filling. A meaty South African type of stew done in a steel pot on an open fire called a braai. A traditional South African / Cape Malay dish made of rice, minced beef, egg and sultanas. Delicious, especially with some Mango chutney. There are loads to choose from! Koeksisters are twisted pastries that have been soaked in syrup. Milktart is a crusty pastry filled with a milky sweet filling. Rusks is dried bread made with buttermilk and aniseed. Dip in coffee - great!! Translated as Barbecued Meat - enjoy the red meat in this country - fresh and delicious! You can find excellent hotels in Stellenbosch and South Africa. Many of the main hotel sites will have listings for you in Stellenbosch. Find Stellenbosch Hotels. There are hostels and cheap accommodation in Stellenbosch. Prices vary from hostel to hostel but are generally affordable. Search and book Stellensbosch Hostels. There are numerous excellent bed & breakfast accommodation options available in Stellenbosch, try one our booking services mentioned above to find a place to lay your head down at night. The closest airport to Stellenbosch is Cape Town International and is about 45 minutes away from the town. A car is the best way to visit the town and the surrounding area. The roads are good but drivers are not to be trusted, drive defensively. Driving is on the left-hand side of the road here. Some areas are best avoided while driving. Stay to main roads and highways to avoid any possible mishaps. Central Stellenbosch is very safe to walk through and visit all day. However, stay aware and avoid unlit areas at night. Big VW and Toyota Combi taxis, usually white, are best avoided as tourists. South Africa has 11 official languages so you will hear a variety of dialects. The most widely spoken in Stellenbosch are Afrikaans and English with Xhosa very prominent as well. GMT +1 or +2, depending on the time of the year. South African Rand divided into 100 cents.